This week, Maryanne Wells launched a Kickstarter Project to fund research for Book 4 of the Undead Bar Association Series, a book she's titling Deadhand Control. "I'm excited about this launch," said Wells, from her home in Amarillo, Texas. "The plot of Deadhand Control involves a lot of history, so it's the perfect book to invite readers into the research experience. For contributors, I'll be recording video updates of my research trips, sharing the good, bad, and ugly." Deadhand Control picks up where Book 3, Binding Deceit, left off. But, readers do not need to be familiar with the earlier books to enjoy this new addition to the Undead Bar Association Series. Like each book Wells writes, Deadhand Control is a novel that can stand alone. The historic focus for the book is the Red River Indian War in 1874 and the immediate preceeding events. Wells plans to send modern characters back in time. "Imagine a woman in her twenties, an African American man, and a US Army vet who served in Afghanistan, being sent back to the 1870s. Each one of them will face a unique kind of culture shock," promises Wells. "Add in evil Vildru sorcerers and Indian medicine men, and the scene is set for some powerful magic." Though Wells only recently confirmed the book's plot, she's been thinking about one of the characters for decades. "I started researching General Ranald S. Mackenzie in high school," Wells reports. "Someone told me the Civil War hero was a distant relative, and I read everything about him I could find. When I moved to Amarillo five years ago, I realized that one of his most significant Post-Civil War campaigns happened just down the road. Mackenzie is a complicated and ultimately tragic figure. As a character in Deadhand Control, he'll bring a lot to the world of the Undead Bar Association." 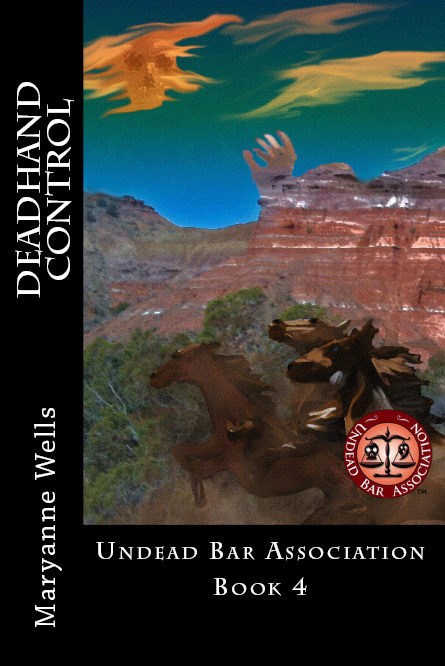 Contributors to the Kickstarter project for Deadhand Control could receive Undead Bar Association Books, coffee, and the chance to name a character in the book. Product received depends on contribution level. There are a total of 14 contribution levels offered, ranging from $1 to $1000. "Most of the contribution levels are unlimited, but there's room for only one fan at the $1000 level," Wells explained. "At that level, the contributor has the chance to name a recurring character, plus receive books and coffee. "The character at the $1000 level is a puppy. Maybe that sounds strange for a book about the undead, but really, it makes sense. One of the historic characters in the book had a dog who had puppies about the time action in the book occurs. I decided to use one puppy in the book, and fans with whom I discussed the plot already convinced me to include the puppy in other stories, too. So, whoever gets to name that character pledges top dollar to be the Top Dog. Pun intended." To learn more about the Kickstarter project for Deadhand Control, visit Kickstarter. The project will be open to contributors until noon on Saturday, September 7, 2013. Publish date for Deadhand Control is early February of 2014.